Numbers provide one important indicator of the current shape of the profession. Gill Matthewson explains where we are at in a piece originally published in the AA Dossier on Gender Equity. Figure 1: Percentages of women in Australian architecture, 2012. Diagram by Georgina Russell using analysis by Gill Matthewson and Kirsty Volz. It is not easy to quantify exactly who works in architecture, or how they work. Figure 1 (above) represents the most accurate and comprehensive picture ever made of the participation of women in architecture in Australia. 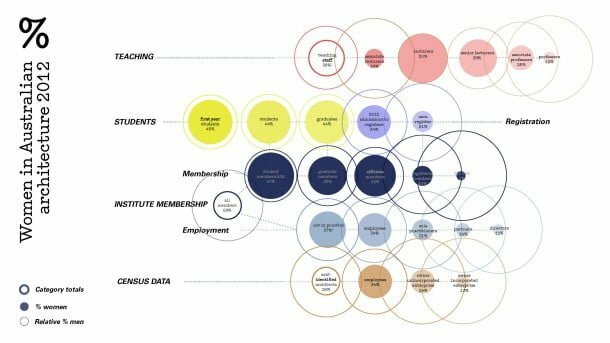 But even this diagram is really a kaleidoscope of fragments, because almost all of the existing sources of empirical information have their problems. So if the data is incomplete or flawed, why do numbers matter? Well, they do still sketch a rough shape of the profession and, as all architects know, sketches can tell us a lot. Looking at figure 2 (below), we can see that the number of architecture graduates in 2012 had more than tripled since 1987, that male graduates have more than doubled in number, and that women are over six times as numerous as they were in the late eighties. Relative to the total population of Australia, architecture graduates are twice as plentiful as they were in the eighties. Figure 2: Number of architecture graduates by gender, 1987–2012. 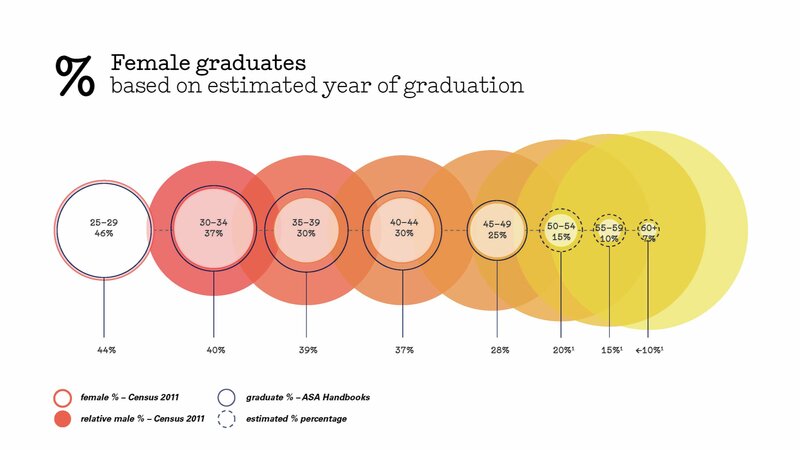 Figure 3 shows the percentage of women graduates growing rapidly last century and hovering at around 40 percent for the past two decades. 1 This means that at university, no female student of architecture in the last twenty-five years would have been the sole or one of very few females in her class, as would have been the case in previous decades. Unlike some areas of study, such as IT or engineering, women are by no means a small minority in architecture: across the country they are enrolling and graduating at rates nearly equal to men, although they are not yet quite half. 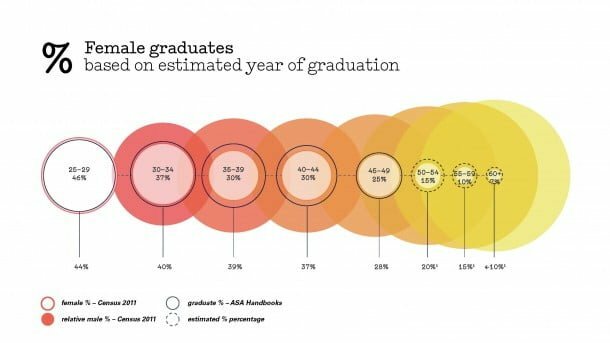 Figure 3: Female graduates as a percentage of all architecture graduates. But if information on enrolments and graduation is fairly accurate and comprehensive, it is when we try to count the number of people actually working in architecture that problems arise. The usual method is to use registration figures, and indeed the growth of registered women in architecture since the 1980s is spectacular. Information from the state registration boards shows that there was nearly seven times the number of registered women architects in 2012 than thirty years previously (2,607 compared with 383 in 1982).2 And while they were just 5 percent of registered architects back then, in 2012 they constituted 21 percent. But because registration is not compulsory and it is both easy and common to work in an architectural practice without it, registration numbers and proportions can misrepresent the situation for women. Such counts cannot recognize or give shape to those who are not (or are not currently) registered. Although the 2012 Architects Accreditation Council of Australia (AACA) compilation list of architects has been a step forward, it is still difficult to establish accurate, up-to-date national registration rates as people can register in more than one state and so can be counted more than once.3 In addition, each register can be remarkably fluid: for example, the New South Wales register declined in overall numbers in 2011–12 despite having 212 new admissions, because 225 individuals left in the same period.4 For many, attaining registration is a significant milestone, important for symbolic and identity reasons as a mark of status in the profession, as well as the ability to legally call oneself an architect. 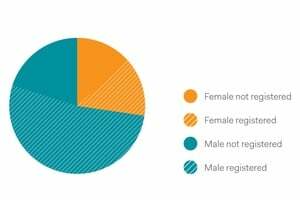 But the data shows that once registration is achieved, individuals seem to be less tenacious about keeping it, although women seem to maintain registration longer than men. Analysing membership of the Institute initially promises a better picture of the profession, since it potentially includes those who are not registered. In 2013 women made up 28 percent of Institute members. But this proportion is also not entirely representative because, like registration, Institute membership is not compulsory. The figure is also skewed because owners of firms are more likely to be members than employees, and because nearly one quarter of the membership is students and nearly half of that student membership is female. In addition, my research indicates that just under half of all registered architects are not members of the Institute. Figure 4: Proportion of workforce registered/not registered by gender. Interestingly, the proportion of women among Institute members (28 percent) is matched almost exactly by the proportion of women working in architecture as reported in the 2011 Census. This has risen from the 2006 Census, which quantified women as 23 percent of the architecture workforce.5 This is a higher proportion than that given by registration but still low compared to percentages in other professions as measured in the same Census – for example law, a profession in which women constituted 45 percent, and medicine, in which they made up 40 percent. Census data is somewhat problematic because the information is self-reported, allowing anyone to describe their occupation as “architect” – whether or not they are an architecture graduate, Institute member or registered architect – making it difficult to correlate with other data sources. Nevertheless, crossing between various sources of information, I estimate that the non-registered portion of the working profession (those doing architectural work) is just over a third of the total (the solid-coloured segments in figure 4, above). Barely half of the women in this workforce are registered but over three-quarters of the men are. This is partly due to women being admitted to the registers at a rate markedly lower than their graduation rate – in 2012 they were 44 percent of graduates but only 34 percent of new registrants. Figure 5: Proportion of women in Australian architecture by age group and extrapolated year of graduation. No matter which measure is used, women clearly still represent less than a third of the architecture workforce in Australia – a surprising figure when we know that they have made up around 40 percent of graduates for the last twenty years. This discrepancy is vividly illustrated in figure 5 (above), which uses Census and graduation data to track the percentage of women in architecture by age cohort, compared with their graduation proportion. This enables us to visualize how women appear to leave the workforce at greater rates than men after they graduate. While the diagram involves some approximation, the contraction is clear. Numbers are not an end in themselves, but they do act as indicators by what they do and do not show. The indication here is that the position of women in architecture is more complex than basic empirical figures can illustrate. Better, more inclusive and more nuanced data sources could help us not just understand how many women there are working in architecture, but also ascertain in what ways they are working and how this changes across the course of individual careers. Until we have a better understanding, architecture will continue to lose women, to the profession’s detriment. Their limited presence is a sign that something is not right. This was first published in the AA Dossier: The State of Gender Equity, in Architecture Australia vol 103 no 5 (September/October 2014) and also available online. Read the other pieces in the dossier here. Photo of Gill Matthewson at Transform by Jonathan Butler.